Found a Monarch caterpillar on my milkweed! 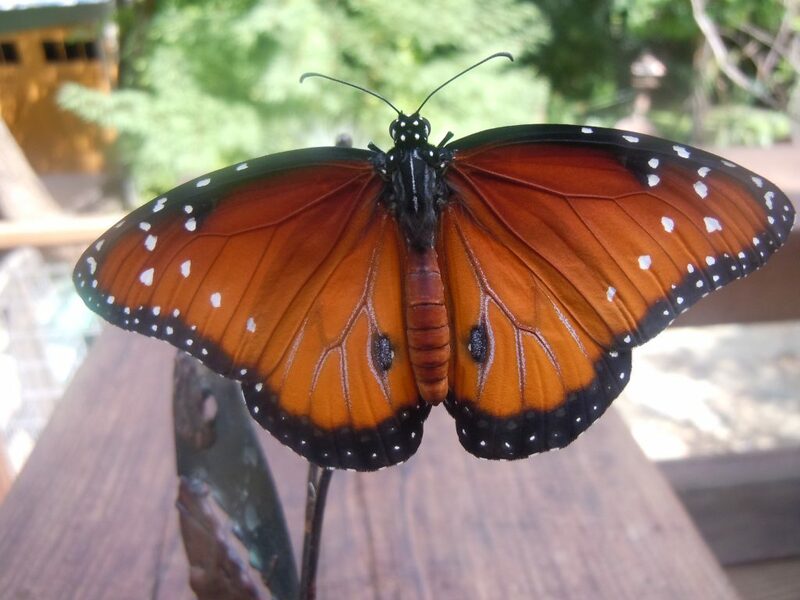 Every year around this time as the Queen butterflies start to show up, we get lots of questions about how to tell the difference between Queens, Danaus gilippus, and Monarchs, Danaus plexippus. And with the warm weather that has gripped South Texas throughout November and now December, many of us are still finding eggs and caterpillars in the leaves of our milkweed. Queens are here en masse. As it turned out, the caterpillar in question that my friend Hugh texted me about (excuse the typos) was in fact a Queen. The giveaway: it had three sets of protuberances, rather than two. These protuberances are often referred to as antennae, but they are actually a type of sensory organ called tentacles. Most caterpillars–including Monarchs–have a set of tentacles at the front of the body and another at the back, but others–like Queens–have another set somewhere in the middle. Tentacles help caterpillars sense the world around them through touch, and can also throw off predators by disguising the caterpillar’s head. Caterpillars also have antenna, but these organs are far less obvious and helpful for identification. The antennae are short, spiky projections on either side of the caterpillar’s mouth. 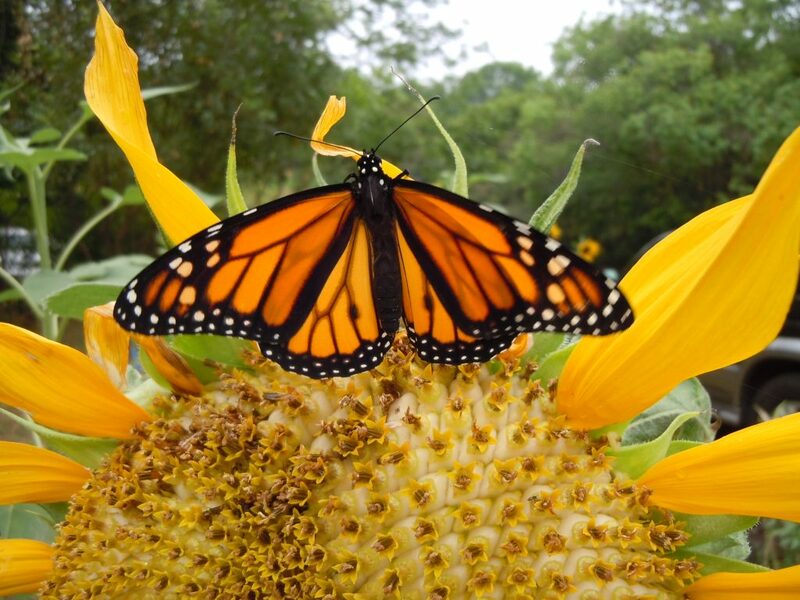 Hugh’s confusion is common: because of their similar color, size and affinity for milkweed as a host plant, Queens and Monarchs are often mistaken for each other in their various life stages. But once you look closely, it’s not that hard to tell the difference between Monarchs and Queens. First, Queens appear solid orange compared to the varying shades of a Monarch. 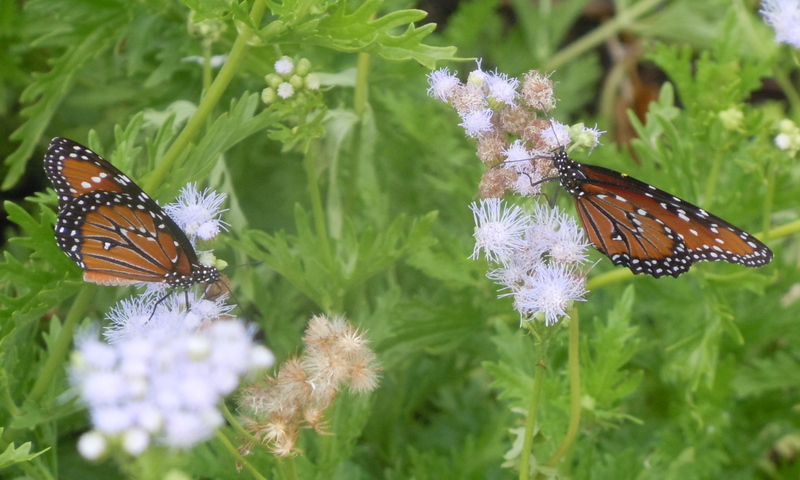 In the photo above, notice how with their wings folded, the Queens’ solid dark orange is interrupted with occasional white dots–nothing like the striking stained glass veins and color pattern of the Monarch below. With their wings open, the difference is even more obvious. The Queen is solid, the Monarch has varied coloration. Both of the examples below are male butterflies, as you can see by the prominent display of their family jewels–the defunct pheremone sacs that presumably once drove the lady butterflies wild. Queen butterfly. It’s a male. Female Queens and Monarchs don’t have these prominent markings with wings open. In Monarchs, the black veins are generally wider and more pronounced in the females. In the caterpillar stage, the most obvious difference is that Queens have three sets of tentacles, while Monarchs have two sets. Queen caterpillar sports three sets of tentacles. Notice in the photo above, the Queen has what appear to be THREE sets of protuberances. The Monarch caterpillar only has TWO. Both wear distinctive yellow, black and white striped suits. The Queen often will have a slight red blend as the tentacles connect to the caterpillar’s torso. The patterns of the stripes can vary depending on time of year, humidity and diet. Scientists don’t fully understand the biological purpose of the tentacles, which seem to reach out and “feel” the universe around them. They swerve and turn in various directions, almost punctuating caterpillar moves like a roving eye or arched eyebrows on the human face. For the sake of identification, let’s just say their purpose is to signal the difference between Queens and Monarchs. For more on filaments and what we do and don’t know about them, check this link on the Monarch Watch page. Queen and Monarch chrysalises. Monarch in the middle. In the chrysalis stage, Queen chrysalises are almost identical to Monarchs, except they are generally smaller. They also sometimes offer a subtle pink hue, as evidenced in the picture above, Monarch in the middle, Queen on the sides. I wish there was a phone number i can call with my questions and problems. My heart broke when i had to euthanize one last nite. The wings never developed. Now i brought the rest of my 15 chrysalises indoors because its rainey and low 60’s. Dont know if i should put a plant light on for them or should i mist them etc. There are wonderful Facebook groups that are great quick resources when you have questions. The Beautiful Monarch is one of them. I have two chrysalis both small compared to the others and light colour but the caterpillar did not have the third set of antenna. I do have a caterpillar with a yellow face and yellow legs. Can you explain. Thanks for this website with great pictures. I am in Tucson and have been planting milk weeds around my property. Yesterday noticed that I have both Monarch and Queen caterpillars eating from some of the nonnative plants. I am so pleased! This website is awsome! I do have a question, 3 days ago I got my first male Queen Monarch. It did not have the black dots on the middle bottom of the wings. Today I got another one! This one did have the black dots on the bottom of the wings! I think this one came from an all pink chrysalis! Can this be possible? Obviously this is a male and female. What would be the correct name? Male male Queen Monarch? I’m confused, they did come from my milkweed plants. This is my 3rd year raising the monarchs. My total healthy releases are 1,881 as of today! How long will a queen stay in crysalis form? I have had one hanging in my butterfly tent for 2 or 3 weeks. I was thinking it would eclose in about the same time as a Monarch. Am I wrong? I saw my first Queen Butterfly today with Monarchs on milkweed in Northeast Texas. Are Queens rare in this part of Texas? I have tons of Queens in my yard here in Bedford, TX. They’re also plentiful in the Hill Country. Plant Greg’s Blue Mist flowers …. they’ll swarm to it in the late summer. Thanks for this article. I have some nearly ripe Monarch ‘pillars, and I found a few itty bitty ones. The itty bitties had an extra set of “feelers” and I wondered if they had been parasitized. Glad to know it’s perfectly normal…for a different species. I try to always have something in bloom – lots of lantana, milkweed, and pentas – to invite in all of the nectar-ers an pollinators. I m raising my first monarchs. So amazing. Enjoying your info I am in Ohio. If we’re not to blame Monsanto’s Round Up, then what other explanations are there for the huge decline in Monarch migration? I found eggs on my milkweeds last night. I know for sure 3 of them look just like my monarchs from last year but I have many many more that look the same except they are smaller. Could these be queens? Or another type of butterfly? Or do monarchs sometime lay smaller eggs? Thanks! Note that the two anterior filaments are not antennae. The antennae are actually minute structures just above the mandibles. Living in Mass. usually means your winters make the milkweeds go into dormancy. Don’t pull up milkweeds. Depending on the age and type of milkweed you have they will either “die” back all the way down to ground level or they will just lose their leaves. If yo want to blame Monsanto or any of your neighbors for spraying insecticides look for caterpillars throwing up of having diarrhea. Otherwise their frass (poop) should look like a black piece of Grape Nuts. Remember that only 10% of eggs grow up to be butterflies. I will receive some of this summer’s milkweed now erupting from their pods. Monarchs in Massachusetts have been scarce in the past two years. Before this I have raised and released about 250 Monarchs a year. I have butterfly bushes and milkweed plants in my yard and many other kinds of butterfly plants, yet they have declined. I have promoted to others that milkweed needs to be left alone when found and not pulled up. We do have other butterflies like Swallowtails visit and plant their type of food. Now, it is up to people to demand that Monsanto-like chemicals be stopped if we want to continue to see all butterflies. Appreciate all o the info about butterflies, very helpful. We are doing a monitoring on the migration route in Tamauipas Mexico and your info is excellent. Thanks! I found a caterpillar on the greens, of a carrot. My five year old and I have been feeding it in a commercial net butterfly garden. It looks very much like a monarch caterpillar but when touched, on the face, two yellow antennae extended and retracted. Any clue what it might be? Sounds like a Swallowtail. 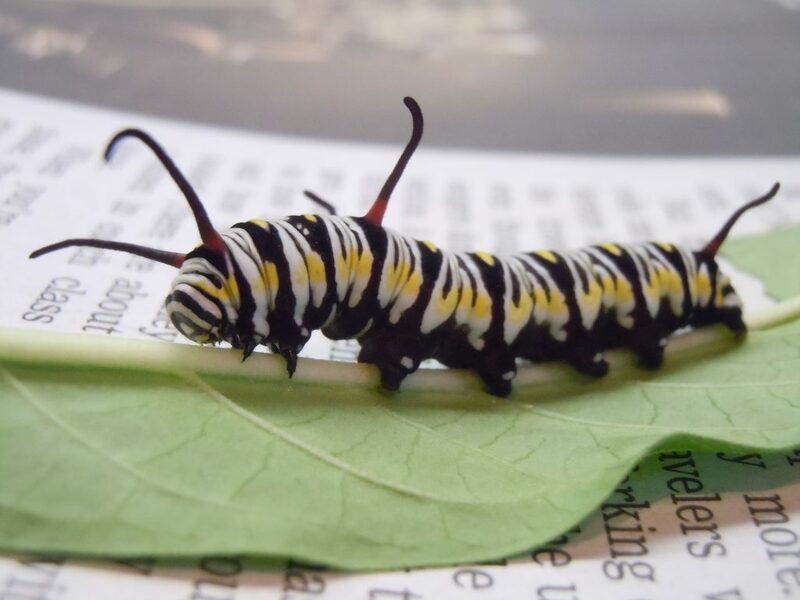 See this week’s blogpost: https://texasbutterflyranch.com/2014/07/01/how-to-raise-eastern-swallowtail-butterflies-at-home/#comment-181176 . Is there a difference between orange monarchs and the yellow ones? Besides colour? I have been raising monarchs for several months, and have found what appears to be a monarch caterpillar with 2 antennae, 2 sets of filaments immediately behind that, and the tail filaments, for a total of 8 antennae/filaments. Other than that it appears to be longer than usual, but the same monarch colors. Do you recognize this? It is nearly ready to turn…I have never seen one like this before. Any clues? Appreciate all of the pictures and information about butterflys. When possible, can you place some object, like a key, in the pictures for size reference?